You know exactly what I’m talking about! Those delectable tender strands were tucked away in a bag lost in the fridge never to be seen again. Until right before you find them weeks later and toss ’em out. 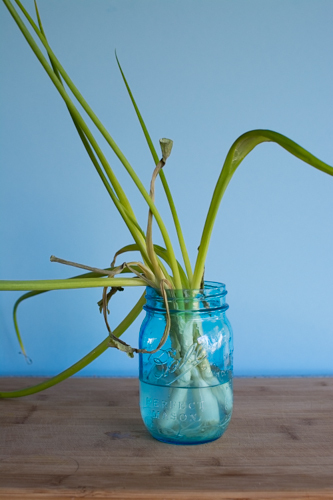 I’ve got the answer of how to bring green onions back from the dead and it has to do with water. Recover them from the depths of the fridge. Grab a mason jar and fill it with 1-3 inches of water. Trim the white ‘whisker’ roots to remove just a little bit. 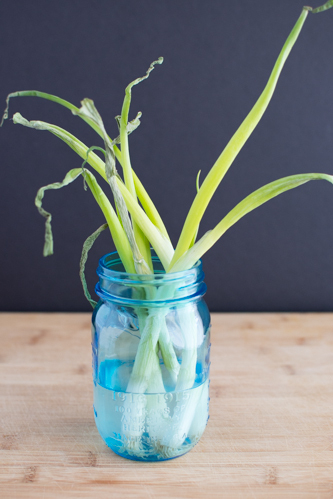 Plop them in the water-filled mason jar and leave them on the counter (or in the fridge). The next day there’s not a noticeable difference on top yet but the roots have stretched just a little bit. It’s a good idea to change the water every day or every couple of days, but if you forget it’s not the end of the world. 12 days later and they are out of control and dancing with life. The roots have gone wild and the outer leaves that were dying off are still there but life has bloomed from within. Peel off and throw away the outer dry leaves, the rest is ready for a recipe. Don’t need them quite yet? Put them back in fresh water and they’ll keep doing their thing. 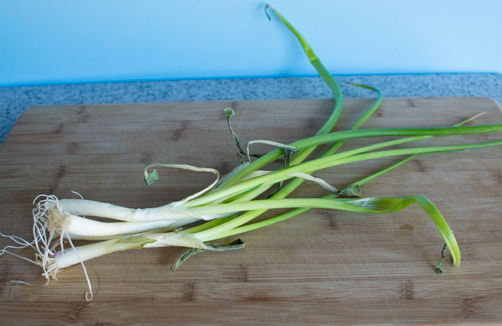 In fact you can put green onions right from the store into water and prevent the whole finding ‘dead’ onion story. Hello, and thanks for all the good growing tips. 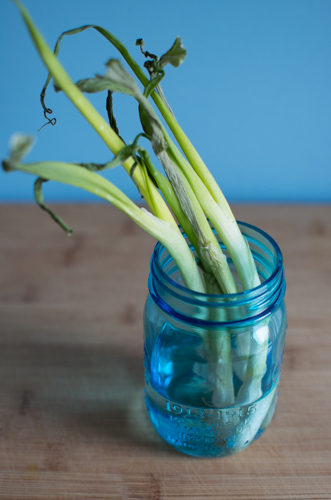 I bought a bunch of scallions just yesterday, and they’re already wilted. I put them in about 2 inches of water in a plastic cup, and set it in the kitchen window. They were nice & vibrant when I went to bed. However, when I got up this morning, I was shocked to see that they’re all wilted and dull. I thought maybe the window sill was too cool, but I saw that your other method of storing them is to put in a glass jar, cover with plastic & put in the fridge. So the cool window sill can’t be the problem. I trimmed the white ‘whisker roots and put them in a GLASS jar of water this time. 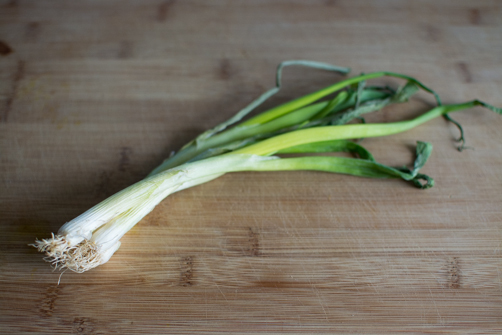 Hopefully, in a couple of weeks I’ll have FRESH scallions again. Any idea why they wilted on day #1? Was it the plastic vs. glass, or that I didn’t initially “trim the hairs”? Hi Ms. Ruby! I’ve had the very same thing happen and I’m not sure what it is? I should be keeping a little scientific journal. 🙂 I have had them adjust back to normal by the 2nd or 3rd day. Best of luck!